Curious, deliberate explorers, foxes live on the edge of forested areas. You can look for their deliberate tracks, straight and true on the edges of fields where the world gets brambly. Hunting for small rodents in the subnivian layer, sometimes you luck out and find a place where a fox has pounced into the snow to grab a tasty mouse to eat. Snowy weather brings the opportunity to see these stories left by animal tracks. We have enjoyed some good tracking weather in Vermont over the last couple months. 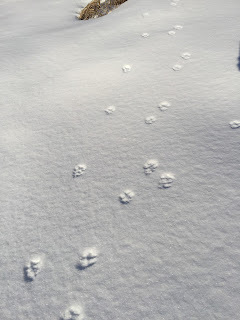 As winter temperatures rise and fall, wildlife leave a mark as they search for food on the snowy landscape. 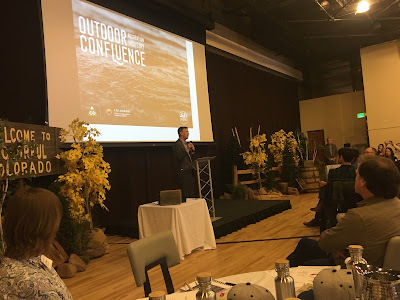 Vermont Delegation Takes Part in National "Outdoor Recreation Industry Confluence"
DENVER, Co- A Vermont delegation of outdoor industry professionals will participate in the Outdoor Recreation Industry Confluence on January 24, 2018 to develop a coalition and platform for strengthening the nation’s outdoor recreation industry. Once the snow falls, there are many fabulous spots to explore on skis all over Vermont. Seyon Lodge has groomed trails in winter, and the Catamount Trail, an end-to-end cross-country ski trail, runs through portions of several parks including Coolidge and Smugglers’ Notch. In southern VT, a loop trail at Woodford State Park takes you around the Adams Reservoir, which sits on a plateau of the Green Mountains. Here are more places to try cross- country skiing on state lands. Have you ever heard about the Iditarod and thought to yourself, "that sounds like fun! "?Here’s your chance! There are several dogsled touring companies throughout Vermont, and October Siberians even offers a 2-hour tour around Little River State Park. Seyon Lodge is unique in the park system: a cozy lodge with 8 rooms, delicious, locally sourced meals, fly-fishing in summer on Noyes Pond, and an excellent trails system year-round. Seyon is open year round, and is a popular destination for weddings and group events like craft weekends and yoga classes. In winter, you can also make a day trip to to go snowshoeing, cross-country skiing or fat biking.